Who knew almond soup was an actual thing? Health goddess and now Amanda Wakeley campaign fronter, Ella Woodward (aka Deliciously Ella) has become known for a go-to for those who are looking to treat their bodies without racking up the calories. The super-blogger has not only got two best selling cookbooks under her belt, but now her own deli, mae deli and has now partnered with method cleaning products to produce recipes based on the main notes in their products. 1. In a saucepan, gently heat the olive oil along with the garlic and salt, taking care not to colour the garlic. Keep the bashed cloves moving in the pan until they start to release their aroma, at this point add in your whole blanched almonds and stir into oil and then add the water. Bring to the boil, then turn down the heat and simmer for 5 minutes. 2. While the soup is simmering toast your slice of rye bread and then leave aside to cool. 3. When your almonds have simmered for 5 minutes, pour your soup into a powerful blender and blend until smooth. It might be best to do this in a couple of batches. 4. Once the soup is all blended, put it back into your saucepan and add water to thin to a good consistency. 5. Cut your toasted rye bread into rough squares, then put them into a food processor and whizz into crumbs. 6. 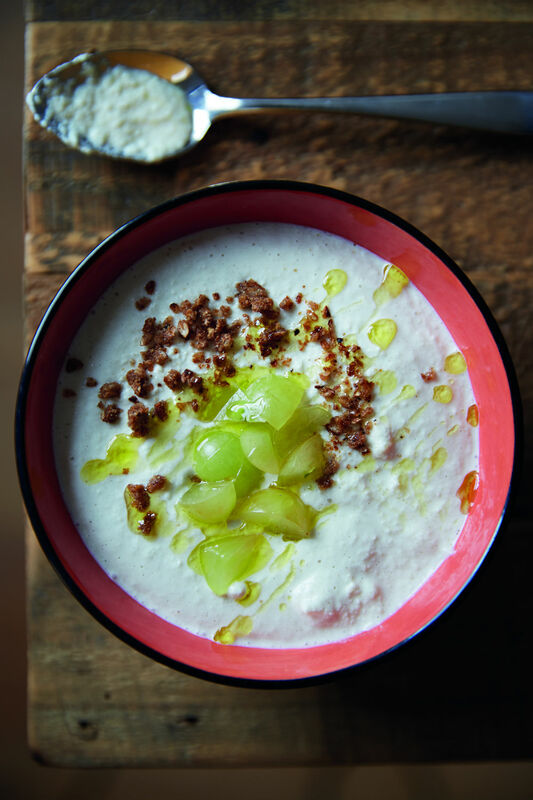 Serve the soup with a sprinkle of rye crumb, a handful of chopped grapes and a drizzle of good olive oil. 1. In a saucepan, cover your buckwheat with the water, bring to the boil and simmer for about 5-8 minutes until most of the water is absorbed. Drain the buckwheat through a sieve and rinse with cold water. Drain again and then put into a bowl, mix in the ras el hanout, oil and seasoning. 2. While your buckwheat is cooking, peel your carrots and then using a julienne peeler, shred the carrots into thin strips and mix into your buckwheat. Next cut the skin and pith from your oranges then cut them into thin circles and mix into your buckwheat salad, letting the flavours all meld together. 3. Pick the leaves from your parsley and chuck onto a serving platter, then mix through with the buckwheat. 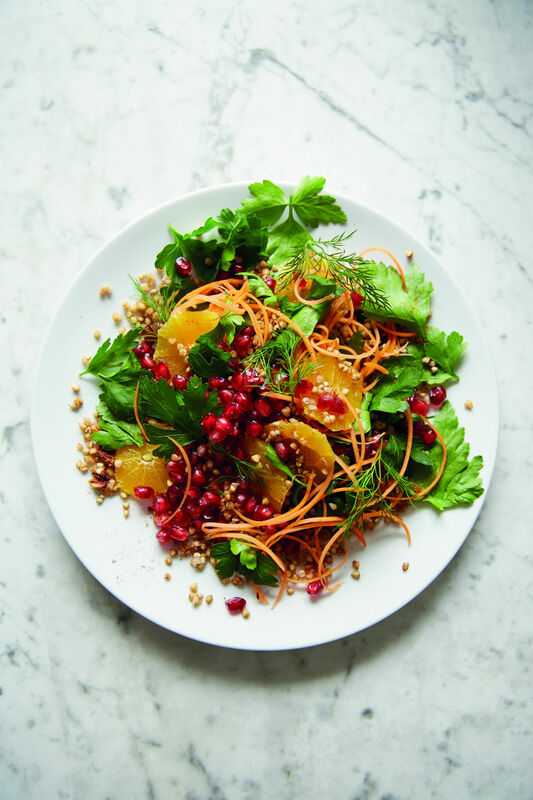 Throw on your dill, mint and pomegranate seeds and give another mix, then serve. You can serve alongside roasted cauliflower and carrots with cumin.